When you are feeding a formulated diet to animals, they are very dependent on the nutritional balance in every bag of feed. Because chickens are highly selected for rapid growth (broiler breeds) or for high reproductive levels (egg-producing breeds), nutritional problems show up quickly. Those problems can arise because of the content of the feed, whether it is adequately mixed, or how it is stored. Figure 1. 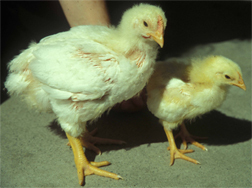 Experimentally salt-deprived (on right) versus normally fed (on left) 3 week-old broiler chicks. Photo by H. Michael Opitz. Figure 2. 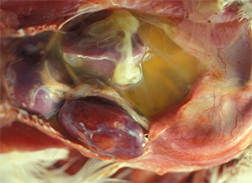 The abdominal and thoracic cavity of a broiler with ascites syndrome, which can often follow salt deficiency. Yellowish fluid can be seen in the abdomen, and the liver is firm and swollen. Photo by H. Michael Opitz. This is known as broiler ascites syndrome, and if it begins to occur in your flock you should consider early slaughter to avoid losing more birds. In older birds, appetite decreases, pecking behavior may increase and egg production is likely to decrease. Why does salt deficiency occur? Occasionally a feed processing company may make a mistake and fail to add ingredients, but more likely a problem may occur with clumping or settling out of ingredients. As well, some forms of salt (like rock salt) are coarser and less miscible than others. In these cases, feed analysis of individual bags of feed may be too low, or too high, in sodium content, although the overall feed mix was correct. In either case there is a problem, because salt is required, but can be toxic at high concentrations. How do you avoid the problem? Read your feedbag label. Most chickens need between 0.12% to 0.2% sodium in the diet. If measured as NaCl or “salt,” it should be 0.4-0.6%. Consider keeping your feedbag labels, after you’ve written on them the date purchased and the lot number (usually printed on the bag itself). Feed dealers like to know if you are having a problem. Provide the right diet for your life-stage/breed of chicken. You can look up dietary requirements for your flock at the National Research Council website, visit the Nutrient Requirements of Poultry, Ninth Revised Edition, 1994 page. Store feed properly. It should be “in date,” dry, and out of direct sunlight. If your chickens are not doing well, consider checking the feed by sending a sample into our lab for analysis. We suggest sending a well-mixed aliquot of about 2 pounds of feed, double-bagged using new, dry, well-sealed ziplock bags to: Cooperative Extension Veterinary Diagnostic Laboratory, 5735 Hitchner Hall, Orono ME 04469.